In the summer of 2002, I met a perfect stranger, from the forums at FloridaSurfFishing, at a desolate public beach near Daytona Beach, FL. It turned out he would introduce me to a hobby that I would be hooked on for the rest of my life. Kurt kept reporting that sharks were being caught every day. Being an avid bass fisherman in Orlando, I thought long and hard about catching a fish nearly 10X the size of my trophy 8lb 10oz large mouth bass. I showed up on the beach around noon with my surf rod and high hopes of catching ‘the big one’. Kurt was easy to spot with his surf cart and oversized gear for the beach fishing. After introductions it was time to catch some bait. Throwing some shrimp and Fishbites out we had a couple of nice sized pompanos in no time. Here’s where things got a little crazy. Kurt whips out steel leaders connected to some BIG hooks. He got both poles rigged up in no time and we headed down to the water to deploy our shark bait. Casting a big piece of meat is no easy task. No matter how you throw it you’re not going to get more that 15-20 yards with 3 lbs of weight hanging of the end of your poll. Kurt showed me the way, casting in knee deep water. His bait landed in water that was maybe 15 yards away in waste deep water. I kept thinking to myself, “There is no way there are sharks this close to the beach”. I followed suite throwing my bait about the same spot as Kurts and headed back to the beach to relax. Twenty minutes later chatting about this and that, I see his pole twitch. He said “Did you see that?” “Uhhh, yah” I mumbled. “He snapped my leader” he says. I was like “How is that possible, your pole barely moved”. Sure enough a shark picked his bait up and wrapped itself in the 400 lb steel leader. One quick movement shredded the cable leaving Kurt with another story about the one that got away. It wasn’t 5 minutes later when my pole doubled over. The line was screaming out when I picked up the pole. Kurt reminds me to count to ten before setting the hook. 1….2….3…I couldn’t take it another second. It felt like an eternity. I tightened the drag and set the hook. I looked up and saw a blacktip shark about 30 yards out doing flying barrel rolls in the surf. I could believe my eyes. “Do sharks jump?” I asked myself. The fight was on. Fourty-five minutes later the shark was in 2 feet of water in the first break. I kept wondering, “How in the world do we get the hook out?” Kurt nonchalantly walks out to where the shark is and grabs him by the tail! He dragged the beast up on the beach where I stood in amazement at the size and beauty of the oceans top predator. Kurt came prepared with his 16″ channel lock pliers to pop the hook out of the corner of his jaw. We snapped a couple of pictures and returned the blacktip shark back to the water to fight another day. After the encounter I had to sit down and let the adrenaline rushing through my body return to its normal levels. Its not every day you see a 6′ shark up close and personal. In the years following this encounter I caught several more blacktip sharks and two nurse sharks. If you’re interesting in learning what equipment you need, where to fish, or how to fish for sharks please visit my Shark Fishing Guide. Also remember the next time you’re in the water and it’s knee deep, you’re in shark country! 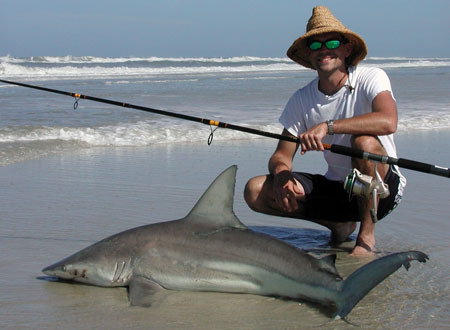 Head a very simple question to ask…a good spinning rod for shark fishing? I live in the city but now that I have a little bit of free time I head in mind to go at see and do some big fishing and I would like a rod that I can do in the beach and in open ocean, what could you raccomand me?? You want a lot of capacity to let it run and work it back in. For a smaller rig you can go with a 6000–8000 class reel with 50 pound braid, 10 feet – 30 yards of 100–200 pound mono shock leader and then your wire and/Or cable rigged to your hook. With the capacity and the drag set right and you playing him right you can bring in sharks up to the 6 foot range at least. I use a pen battle 8000 with 65 pound PowerPro on a 10 foot medium heavy/heavy ugly stick big water. I also have a pen spinfisher V 9500 with 80 pound braid, about 500 yards. That’s my big rig and I put it on either a 7 foot heavy action ugly stick big water for bait swam or kayaked out or a 10 foot medium heavy big water if I’m casting smaller bait. You can go heavier or lighter with the line, but the main concern is that you have 4 or 500 yards of it and you can pretty much take care of anything. I am a big fan of Penn reels so that’s why I have them but really any of the 150–300 dollar range salt water reels from 6- class and above will do the job. My two rigs are approximately $200 and $340 each respectively, including line. my name is Andrei, I live in Sweden and I fish 30-50 kg / pieces of fish in Norway. What should I buy for rod and reel? and where? I want to throw far from the beach. I want to buy surfcasting equipment.